About a year ago, my amazing friend Jen told me her vision for quarterly day-long yoga retreats at her studio. She wanted to theme each one around the season and asked me if I would participate and also cook lunch for the yogis. Jen is one of my very closest friends and one of my favorite people in the world, so even if I hadn’t thought it was a good idea, I would have said yes. But I thought it was a terrific idea and the first retreat happened the Saturday before Mother’s Day last year. We did one in July, one in October and now, one in February. Yesterday was the winter one – she called it Moving Into Stillness. Jen emphasized the need for us to embrace winter and find beauty in it, instead of waiting for it hurry past. She mentioned the importance of home at this difficult time of year and welcomed us into hers. Parents of small children – I know you can understand when I say having a day away is one of life’s greatest treasures. Even just being by myself in the car is precious. Then throw in a ferry ride, a challenging and invigorating morning of yoga, a lunch prepared by me, time to just hang with incredible women, and then another yoga class, another ferry ride, and more time in the car by myself. Nirvana or what? Now that I have done four of these, I have a rhythm down. I get to Jen’s house early and unload my car. Everything cold goes in the refrigerator and everything else goes on the counter in groups of how it will be served. The menus I plan need to be as simple as possible in terms of last minute prep because I only have about 45 minutes to get it all out and that includes a shower (Jen teaches hot yoga). Then, I go down to the studio to secure my mat space and Jen and I get a few moments of talking time before she and I are both “on”. If you are lucky, you have had a wonderful teacher in your life. Maybe you have had several. I had a tremendous 3rd grade teacher, a 9th grade English teacher who taught me how to write, math teachers all through high school who sat with me patiently and explained things over and over, and a physics professor in college who gave me a “B” even though I was doing “C” work because I tried hard. And now, Jen. I have taken and taught a lot of yoga classes in my life. I have never had a teacher like her. She manages to make the class extremely challenging and extremely approachable. She gives very clear and yet minimal instructions on the poses and talks more about real life. Honoring yourself. One of my favorite things she says is, “Try easy. We are always told to try harder. Try easy.” She speaks in English, not yoga speak and she is very real. After a morning of intense self-focus using poses and breath, it always feels a bit weird to change into frantic trying-to-get-the-food-out mode. But I know everyone is hungry (including me) so I do my best to hurry. I worry the entire time that I don’t have enough food. If I made enough to feed 100 (we were 21 this time), I would still worry. One thing I never have to worry about is dessert. Things can be made in advance and people are so appreciative of a home-baked treat. Especially after sweating their guts out in a challenging class. This time I made Honey Nut Bars (recipe coming soon) and these cookies. Sometimes making choices is great and sometimes it is nice to have a choice made for you. This cookie makes a choice for you. Rather than having to decide between a cookie and a brownie, this recipe just combines them for you. Yes, those chunks are brownies. 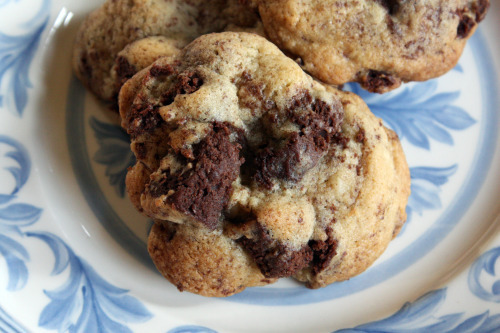 There are lots of nice things about this recipe, one of them being that you only use half the pan of brownies in the cookies. The other half can either be served just as brownies, or you can freeze them for next time. Take note that you will need to refrigerate the brownies overnight before using them in the cookies. Preheat oven to 350°F. Whisk first 3 ingredients in medium bowl. Beat butter and both sugars in large bowl until smooth. Beat in eggs and vanilla. Sir in dry ingredients, then walnuts. Gently fold in brownies cubes (brownies may crumble). Fill a small bowl with water. Dip ice cream scoop in water, scoop batter; drop onto cookie sheets, spacing about 2 inches apart and dipping scoop as needed. Using moist fingertips, flatten mounds to 1-inch thickness. Bake cookies, 1 sheet at a time, until just golden – 15 to 18 minutes. Remove cookies to cooling rack. Preheat oven to 350°F. Line 13x9x2 – inch metal baking pan with foil, leaving overhang. Stir chocolate and butter in heavy large saucepan over low heat until melted and smooth. Cool 15 minutes. Whisk sugar and vanilla into chocolate mixture, then whisk in eggs and salt; stir in flour. Spread batter in prepared pan. Bake brownies until tester inserted in center comes out with moist crumbs attached, about 20 minutes. Cool in pan. Cover and chill overnight. Using foil as aid, lift brownie sheet from pan and cut in half to use in cookies. Serve other half (cut into squares) or wrap well in foil and freeze for up to one month. Whenever I make Indian food, or food that isn’t specifically Indian but that features those intoxicating spices, I make a raita to serve with it. It is such a quick and easy thing to throw together and it complements the food so well. 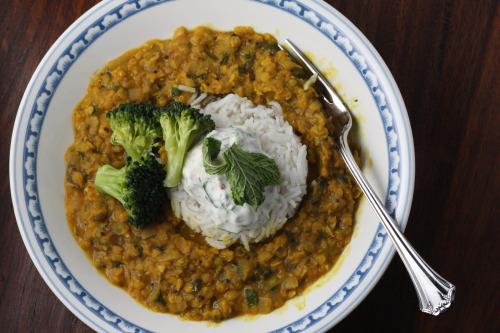 The dhal I made the other night is, as I mentioned, very highly spiced so a nice cooling and and tangy raita goes perfectly with it. My standard additions to the plain yogurt are cucumber, lime juice, and salt; but the other day I had some of this on hand. It’s called dukkah and it is a spice mixture that originated in Egypt. I ground some for a dish that never made it to the table so, rather than waste it, I figured I’d just spice up my raita. Although I mixed cultures and cuisines, the result was fantastic. The dukkah stars coriander seed and cumin seed (among other wonderful things) and both of those spices are common in Indian cooking. So I wasn’t that far off the mark. It can be used, among other things, to garnish a bowl of your best olive oil for pita dipping, and it can also be used to coat soft boiled eggs that sit on greens which sit on toast (the original reason I made it). 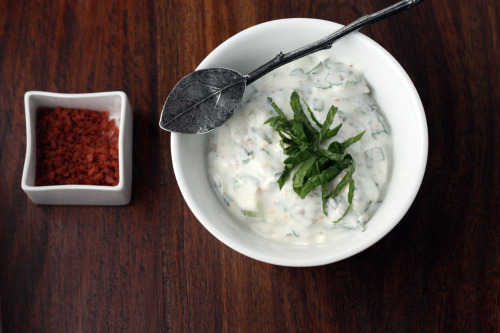 But don’t feel like you need to make dukkah to in order to enjoy the raita. It is wonderful without the spices as well. Oh, and those cute little boxes? They are filled with a variety of sea salt courtesy of my good gift giver of a husband. Feel free to use full-fat yogurt here, or even Greek yogurt. Just please don’t use that nasty non-fat stuff. If you are adding dukkah, use about 2 tablespoons. If you are a cilantro hater, substitute the same amount of fresh mint. Mix all ingredients together in a medium bowl. Taste for balance of flavor. Cover and refrigerate until ready to use. 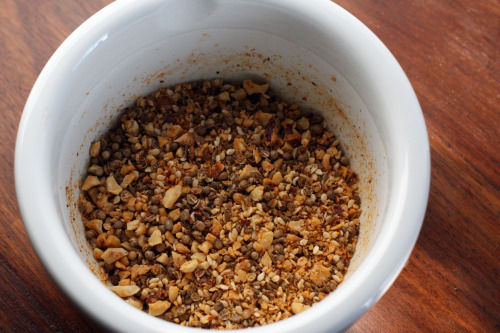 Heat the oven to 350° F. Roast the hazelnuts and sesame seeds separately until golden. Then, roast the coriander and cumin seeds until fragrant, about 2 minutes. Transfer to a food processor or large mortar and pestle, add the remaining dukkah ingredients, and blend until a coarse mix is formed. (Don’t overdo it; otherwise you will end up with a greasy mess.) Store the dukkah in an airtight container until required. Have you read the book Cooking for Mr. Latte? It is by Amanda Hesser who used to be a food critic for the New York Times. She has also written a cookbook and is working on an intriguing project called Food 52. Cooking for Mr. Latte is the story of how she met her now husband (the author Tad Friend) and recipes for the food she cooked along the way. Sound like a familiar premise? I know, these food-memoirs-with-recipes seem to be everywhere these days. I just talked about another one in my last post. But Hesser’s book is from 2003 – before blogs made a big splash and everyone got a book deal. It’s my favorite of the food memoirs I have read. Because she was a food critic, her descriptions of food are expert. You want to be sitting along side her eating. And her recipes are terrific. So much so that I keep this little book on my heavy rotation cookbook shelf. I love the things I have made from this book. And this is my favorite of the bunch. Hesser is the first person who told me about Meyer lemons. The way she talked about them made me go on a mission to seek them out. These days they are easy to find in Seattle, but just a few years ago it took a lot more investigative work. They have become one of those “shoulds” in the cooking world. You know, you “should” eat seasonally, you “should” always use fresh herbs, you “should” make your own salad dressing, and you “should” always use Meyer lemons if you can find them. Well, I agree with the first three in that list. And now that I have used Meyer lemons many many times, I have to say that I’m not sure I agree with that last one. 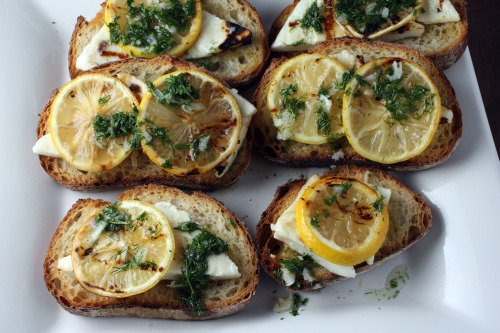 I love lemons. Meyer lemons are more orange-y tasting and I don’t love oranges. So, I’m going against the grain and saying no, in general you “should” use whatever lemons you like. I should have garnished this dish differently for the photo. I know it looks like white on white. But trust me. It is so delicious in that wonderful simple way. And it takes next to no time to make. I can’t wait for spring so I can add some blanched asparagus to this bowl. 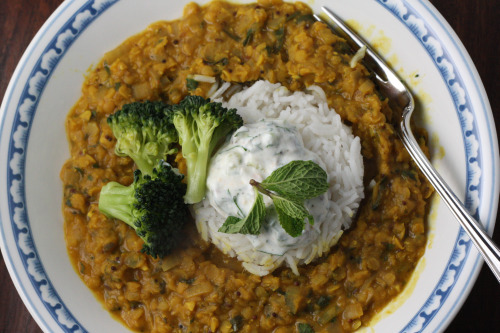 I’ve used all different combinations of herbs in this dish – use what you have. I would keep the amount roughly the same and definitely use the mint. 1. Fill a large pot with water and add enough salt so that you can taste it. Bring to a boil. Pour the vegetable broth into a small saucepan, drop in the garlic and bring to a boil. Reduce by half. Remove the garlic and shut off the heat. Stir in the lemon zest and juice. Season and taste. It should be full flavored because this will be the sauce for the pasta. Keep warm. 2. When the water comes to a boil, add the pasta and cook until soft on the edges but still firm under the tooth. After a few minutes, ladle out about 1 cup of the cooking liquid and reserve. Drain the pasta, shake it lightly, then return it to the pot. Put it over low heat and pour in the broth. Sprinkle in the mint and other herbs and a little olive oil. Add some of the reserved cooking liquid and more lemon juice if needed. Season to taste with salt (keeping in mind that the cheese will add some salt). 3. Spoon into bowls so that the pasta is lying in a bit of broth. Scatter the ricotta salata over it, drizzle with a bit more olive oil (DT: I skipped the oil), and grind pepper over the top.